Michigan’s Wetland Protection Act requires damage to wetlands incurred under a permit to be compensated by creating a wetland someplace else. Image: Wikimedia Commons. A new partnership of state and local agencies is working to set aside state land in Michigan to make it easier for public entities with expansion needs to fulfill wetlands replacement requirements. Because wetlands play a vital role in the health of the state’s environment and its tourism economy, the Wetlands Protection Act requires damage to wetlands that happens under a permit be compensated by creating a wetland someplace else. The Michigan Municipal Wetland Alliance is developing a wetlands mitigation bank system using Department of Natural Resources property as bank sites. According to the Department of Environment Quality website, the purpose of wetland mitigation is the replacement of unavoidably lost wetland resources with created or restored wetlands. Wetland “banking” sets aside land that can be turned into wetlands. Developers who destroy wetlands can buy “credits” that are used to restore wetland acres in these banks. 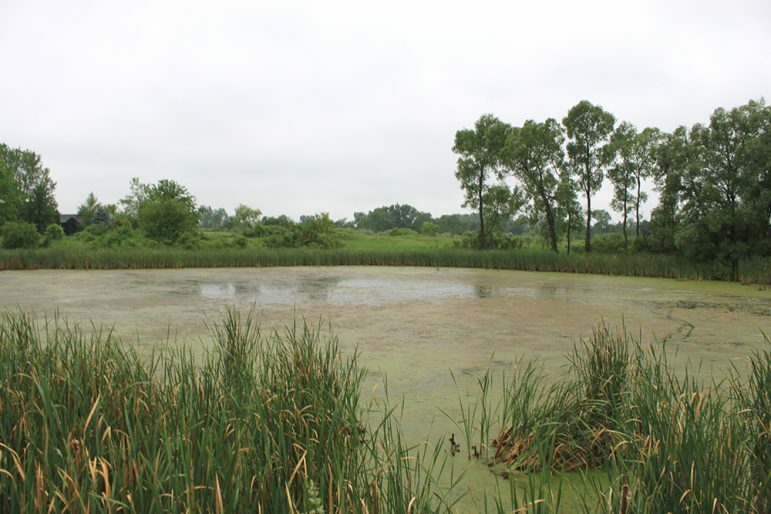 Formed in fall 2016, the not-for-profit municipal wetland alliance was joined by the Michigan Municipal League, Michigan Association of County Drain Commissioners, Michigan Association of Counties, Michigan Townships Association and County Road Association of Michigan. The program is getting attention because instead of purchasing wetland mitigation credits from private property, alliance members, some agriculture producers and other local public developers are eligible to buy credits at a lower price from the wetland alliance. More than 60 watersheds have been included under wetland mitigation banks across Michigan, but according to Stacy Hissong, the legal counsel for the new alliance, many parts of the state still do not have mitigation banks to buy credits from. “Currently we have four potential wetland sites in the Allegan, Monroe, Saginaw and Bay City areas, where we are going to begin designing, and we proposed to use three of them for municipal properties,” Hissong said. Hissong said consolidating wetlands banks into large areas is an improvement over smaller, scattered properties that cannot be watched and maintained properly. Hissong said the alliance offers a win-win situation. Wetland mitigation banks are used in many states, but Michigan officials said the state now leads in using state lands to support public infrastructure construction. However, the new alliance has raised concerns with private wetland mitigation businesses that fear losing customers. “The banking industry is really starting to take off in Michigan, and these proposed banks will be in direct competition with the banks we have established already,” said Steven Niswander, the co-owner of Niswander Environmental LLC in Brighton, the largest private wetland bank company in Michigan. “We are asking for clarification that these public banks will only be used for public projects,” Niswander said. Shine said the Municipal Wetlands Alliance will provide credits only for public cooperation or entitiesdoing infrastructure projects. “So we are trying get ahead of the game a little bit to have credits available to them as they start their infrastructure projects,” Shine said. Hissong said the Municipal Wetlands Alliance brings not only assistance to local governments, but more awareness of the idea of what wetland mitigation banking is in general – even for private property owners who want to use private banks. “Just getting people informed about wetlands and opportunities for this type of project is a good thing,” Hissong said.